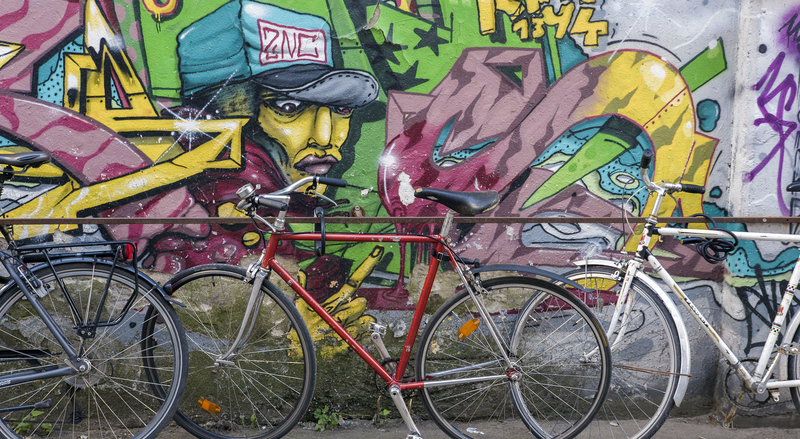 Riding bicycles with Berlin on Bike is one of the best ways to see Berlin. There’s no better way to get to know a new and unfamiliar place than being led around by a local. And while I adore walking everywhere, another ideal way to discover a city is by bike. 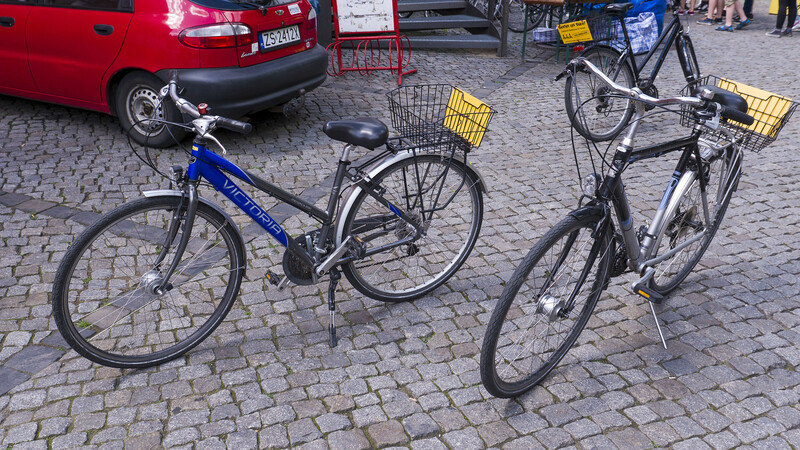 Berlin on Bike has guided bike tours where expert residents show you the most interesting spots. We wouldn’t have ever discovered these areas on our own, and we certainly wouldn’t get to hear the unique stories associated with them. Go beyond the guide book. Learn about local experiences from a local. Travel by bike so you can cover a lot of ground in a short amount of time. Justin and I were treated to a customized private tour with our guide, Sascha. Sascha told us a great deal about Berlin’s ever-changing history, especially regarding its diverse neighbourhoods. 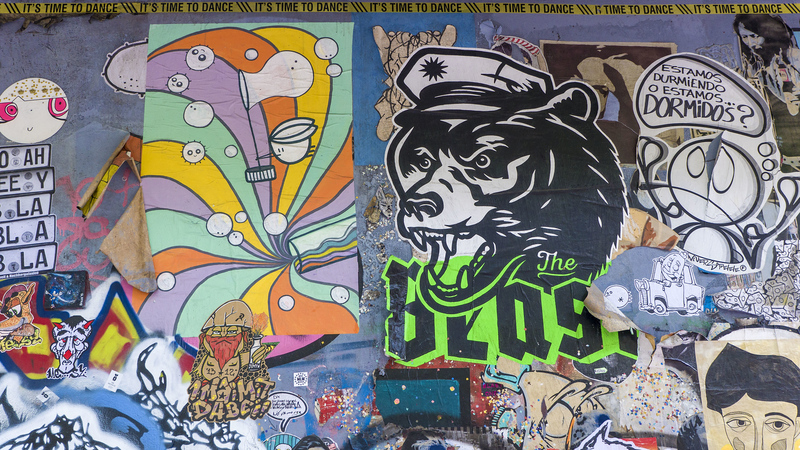 We wanted to see the alternative sides of Berlin, like the countercultural areas with intriguing stories. We really hoped to see some graffiti art, too. 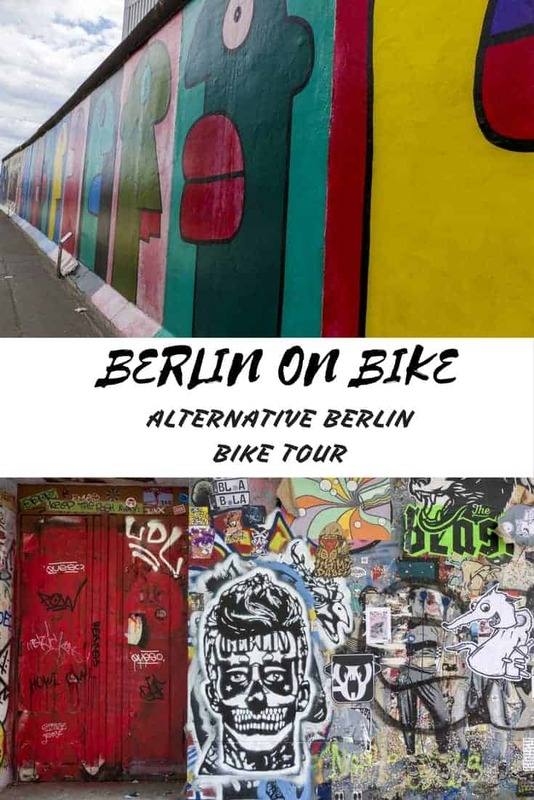 Although this was a private tour, Berlin on Bikes operates an Alternative Berlin group bike tour that you should check out. Private tours are also available for a tailor-made experience. Have you ever explored a new place by bike? What cities are awesome for cycling? 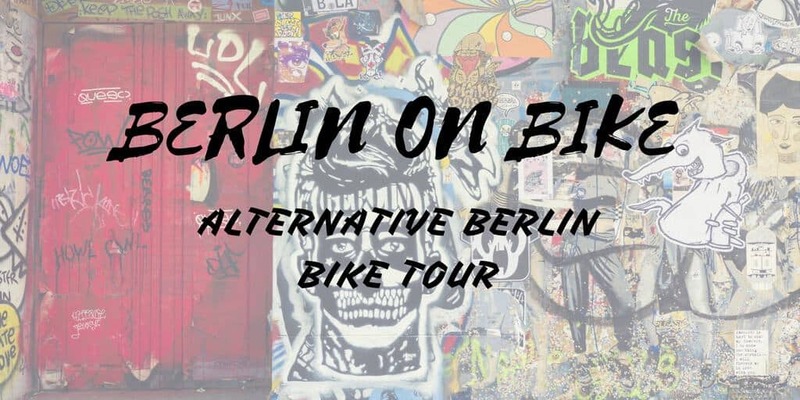 All bike tours begin at the Berlin on Bikes headquarters, “Kulturbrauerei” (culture brewery) in the Prenzlauer Berg district. It’s an old brewery complex entirely restored and home to clubs, theatres, and classes. It reminds me a little bit of Toronto’s Distillery District. It’s an excellent place to practice riding a bike before you hit the city streets. It was about a year since I’d ridden a bike. Sascha helped us set up our bikes and I practiced cycling in this pedestrian zone. Soon enough, we were ready to go. Our tour was about five hours in length and took us in a massive loop around the city. We pedaled through the districts of Prenzlauer Berg, Friedrichshain, Kreuzberg, Mitte, and finally back up to where we started. 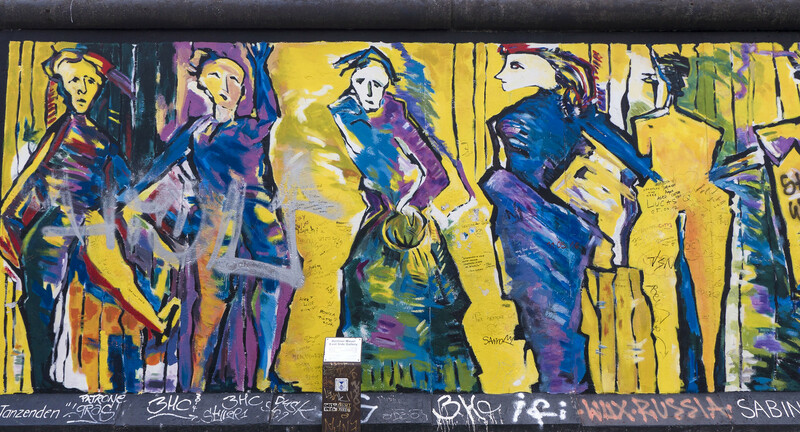 The neighbourhood of Prenzlauer Berg, formerly part of East Germany, was home to bohemians, artists, students, and the gay community in the 1960s and onward. 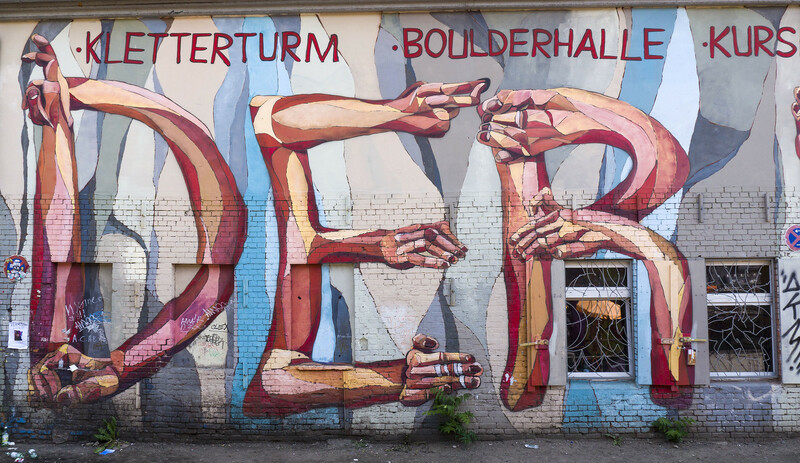 After the fall of the Berlin Wall, many apartment buildings in PB were squatted in by grassroots activists, artsy individuals, and nonconformists. Some of the squats were part of this vibrant scene, with poetry slams, concerts, and underground film screenings popping up. Many residents set up community projects, such as soup kitchens and bicycle workshops. As many of the buildings now contain apartments with a higher rent, many bohemian types have moved to lower rent areas. The beatniks and artists are older, make more money, and have children. Nowadays, it’s common to see many people walking baby strollers in PB. The locals are a little bit older now, yet it’s still a great place to hang out. Justin and I noticed (and visited) a large amount of vegan restaurants in Prenzlauer Berg. There are also plenty of cafes, breweries, and artist studios here. 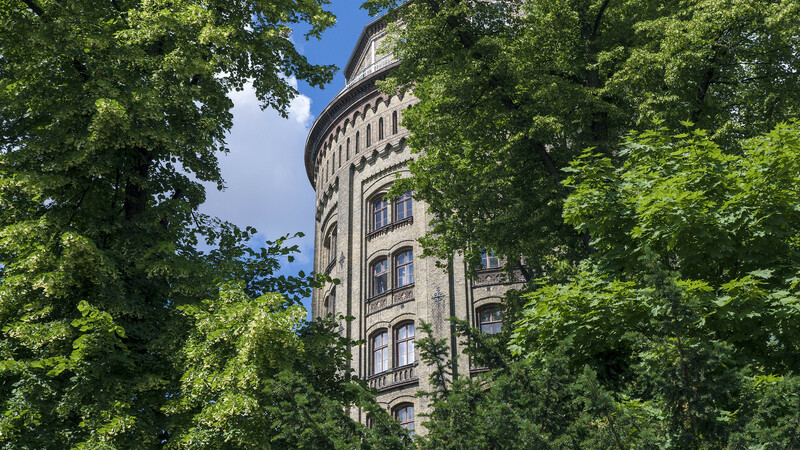 The Wasserturm Prenzlauer Berg, the circular building pictured above, was once a water tower in the neighbourhood. The rooms inside this round structure were the apartments of the water tower workers. They’re now renovated and contain expensive apartments, one example of the gentrification of the district. This is an old brewery building, now vacant and empty. Almodovar Hotel, the hotel where Justin and I stayed in Berlin, is located in the hip district of Friedrichshain. Also formerly part of East Berlin, the trendy Friedrichshain neighbourhood attracted squatters from West Berlin back in the 1990s. Countercultural movements are still alive and well here today, although Friedrichshain has gone through some gentrification. Sascha thinks that it’s only a matter of time that the residents of Friedrichshain experience something similar to what those living in Prenzlauer Berg went through. 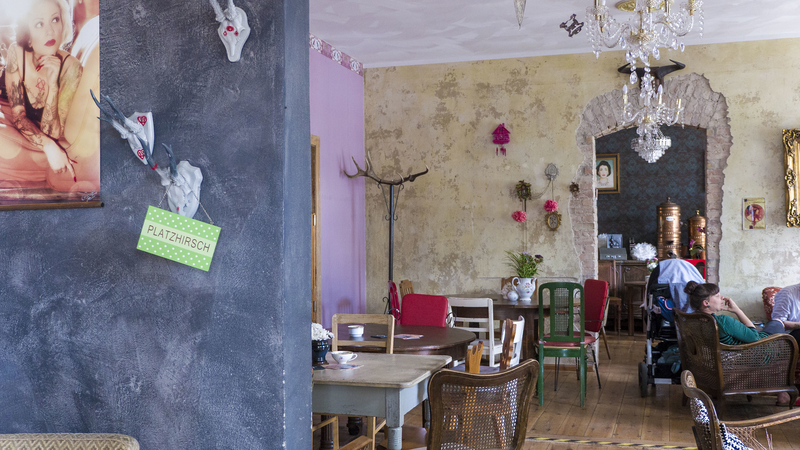 Friedrichshain has many bars, clubs, cafes, exhibition spaces, venues, and independently-owned shops. Riding from Prenzlauer Berg, we glided down the paths of Volkspark Friedrichshain, a large green space. It’s the oldest public park in Berlin and the fourth largest. There are two hills in the park that appear to be natural, but they’re actually old bunkers. Completely artificial, they’re filled with the rubble of bombed out buildings. It’s quite amazing; they’re covered with grass and trees, looking completely natural. If Sascha hadn’t told us about the features of the park, I would have never known. 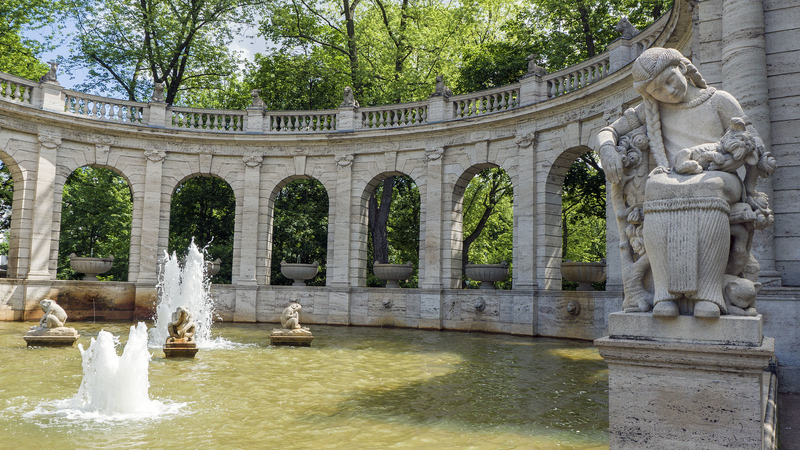 One of the most interesting features of the park is the Märchenbrunnen, or “Fairy Tale Fountain”. It survived the destruction of the Second World War. 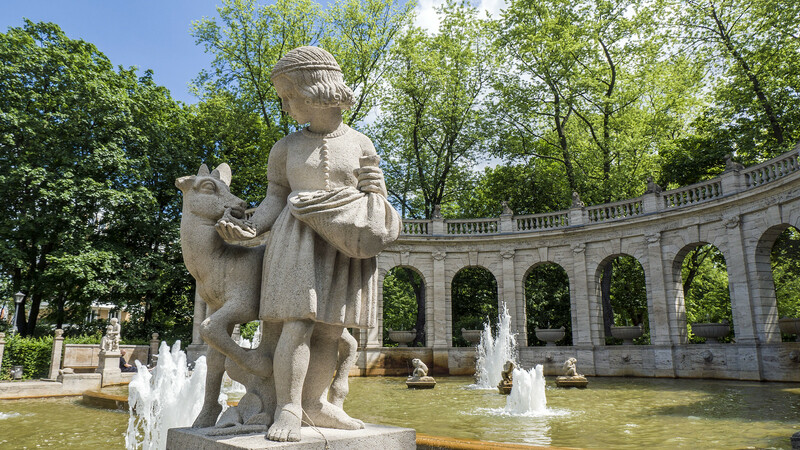 Designed in 1913, the fountain contains 106 sculptures from German fairy tales. In Friedrichshain, it seemed like everywhere I looked, I was treated to colourful and intriguing graffiti art. Sascha took us to one wall in particular that was very interesting. The owner of the building doesn’t mind if artists come to create works on this wall, and it’s covered from top to bottom with art. 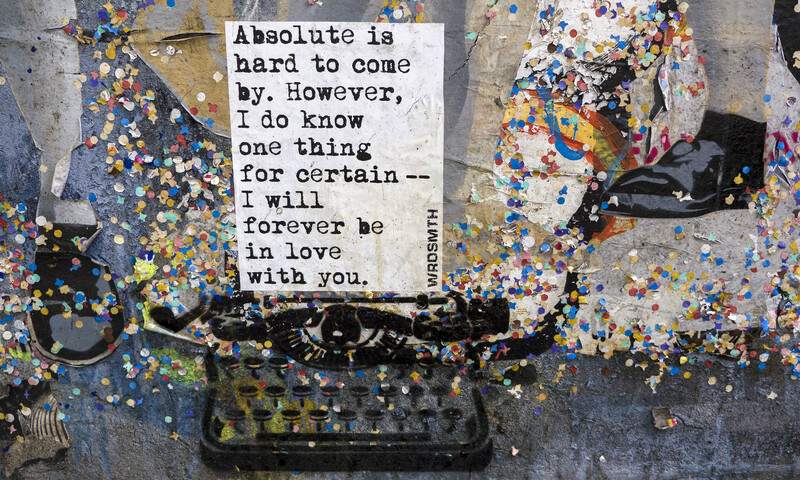 I fell in love with the works of one artist in particular, El Bocho. You’ll see lots of his art all over Berlin. They all feature a little girl character, Little Lucy. Little Lucy is depicted trying to kill her cat using a variety of methods. While I adore cats, I couldn’t resist these cute drawings blended with a dark sense of humour. I could have stood at this one wall alone and admired it for hours. 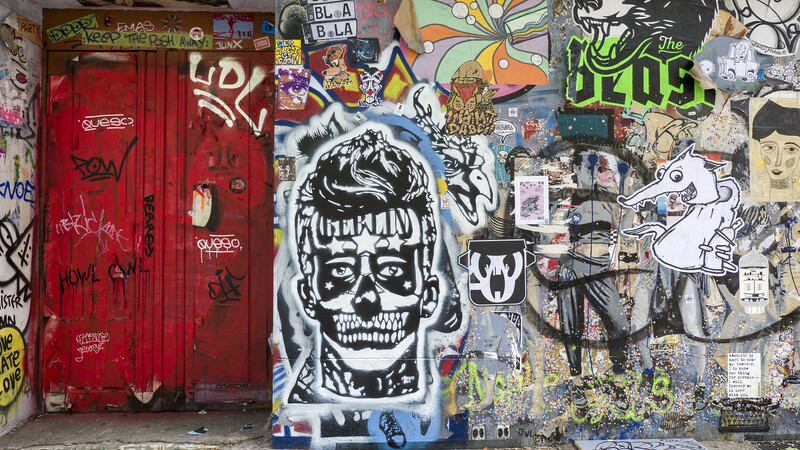 There were layers upon layers of beautiful graffiti. We were grateful that Sascha was leading us around, as we likely wouldn’t have stumbled upon this particular wall. We also would have never learned more about the artists themselves and the types of work they create. Still in Friedrichshain, the three of us visited a pedestrian complex with more stunning murals. This space is home to a skate park and restaurants. It’s a place where people just stop by to hang out. 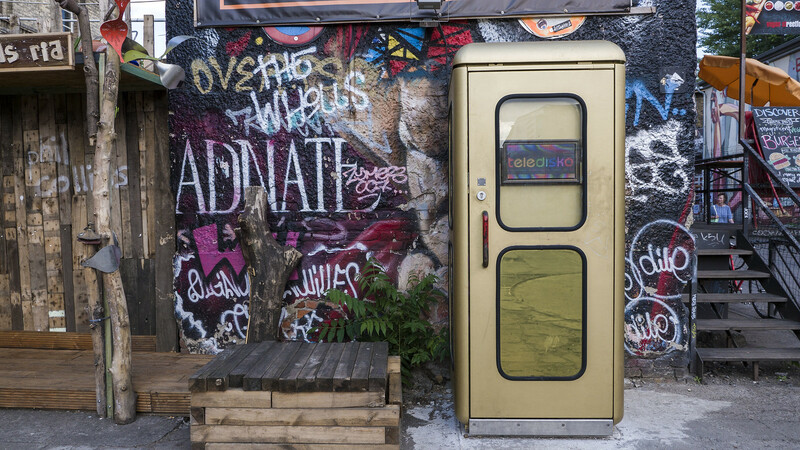 There’s even a jukebox that looks like a phone booth. On another occasion, when Justin and I were dining at vegan hotspot, Emma Pea, we watched a huge group of people gather around this disco booth jukebox. A Rage Against the Machine track blared out into the street, and everyone was jumping around and yelling the lyrics. It was a fantastic moment. Across the street, we rested our legs and refueled our bodies with some lunch. 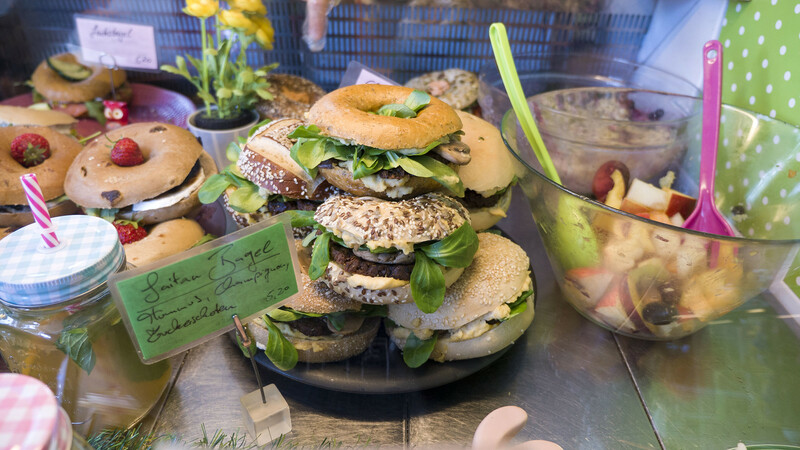 The cozy and kitschy restaurant, Wahrhaft Nahrhaft, had several vegan options, including bagel sandwiches and cakes. Everything with a green label was vegan. We chose to eat seitan bagels and drank refreshing iced tea. Everything was delicious and satisfying. As we sat outside enjoying our meal, we noticed a woman trying to use a water pump across the street. She was trying to fill a jug with water, but it was proving to be a difficult task on her own as the jug kept falling over. Thankfully, Justin went over to help her! 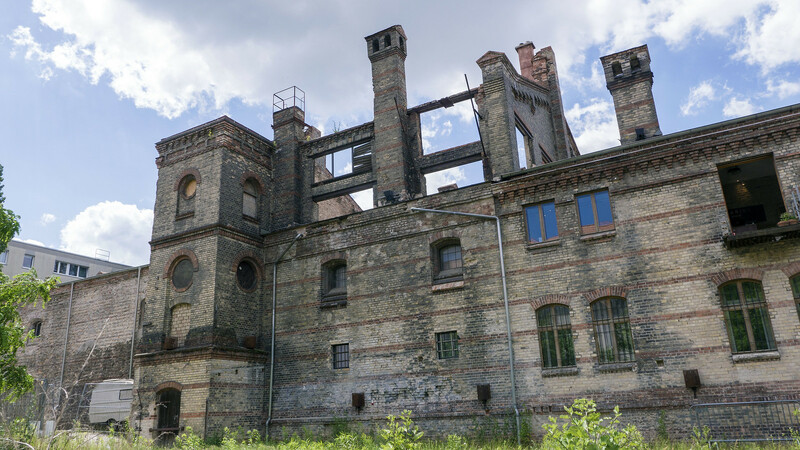 Although it’s not an obscure place by any means, it’s an important part of Berlin history. 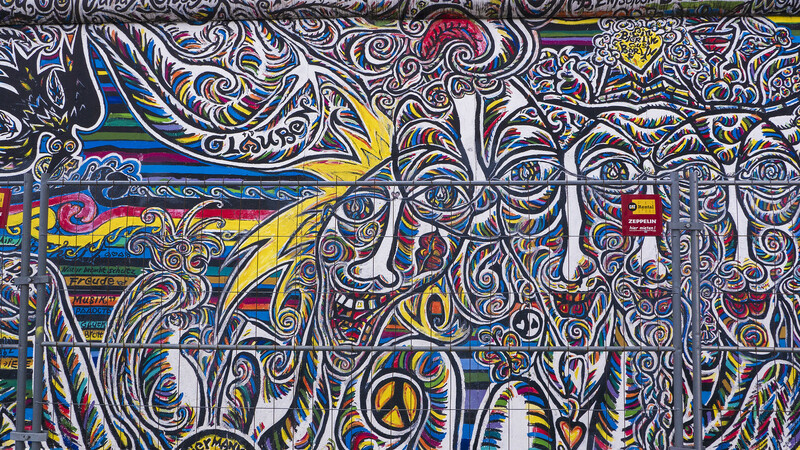 The East Side Gallery is a section of the Berlin Wall that still stands today, and it’s now a massive outdoor public art gallery. 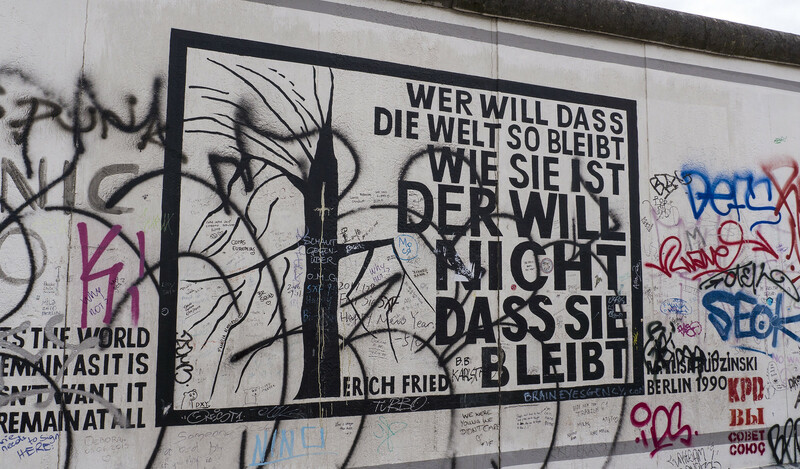 Each section of wall has a commissioned work by artists from all over the world, many of which have strong political messages. The entire gallery itself is a memorial for freedom. We rode along the East Gallery, stopping from time to time to admire a mural or snap a few pictures. Sadly, many of the works are vandalized with graffiti. Visitors have written their names or silly messages on them. Some of the murals are slowly being restored. Unfortunately, many of the restored works in particular are now covered by a ghastly wire fence. The vandals have ruined it for everyone, as it’s hard to capture a great picture with a fence in the way. As you’ll see with the most famous work, My God, Help Me to Survive This Deadly Love (the one with the two politicians kissing), vandals even found a way to pry through the wire fencing to spray ugly phrases on the art. We stopped for a quick photo in front of the Oberbaum Bridge at the Spree River. This double-decker bridge links Friedrichshain and Kreuzberg, two districts formerly divided by the Berlin Wall. 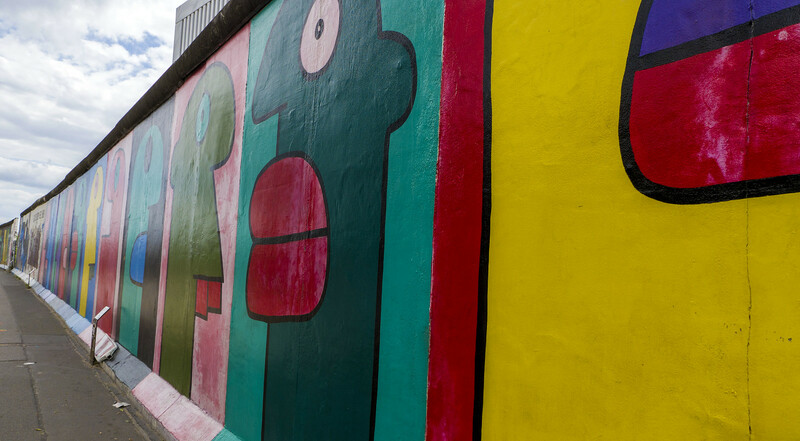 It’s now a symbol of Berlin’s unity. 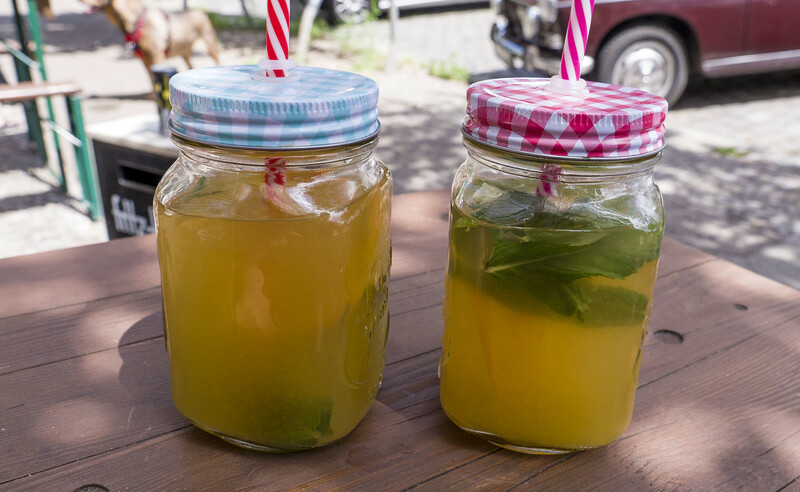 Sascha told us about the annual “battle” that takes place each year between Friedrichshain and Kreuzberg residents. There’s a bit of a rivalry between these two neighbourhoods. Each side engages in a water battle, pelting each other with rotten vegetables, eggs, flour and water to try to “reconquer” the other side. Usually, the Friedrichshain side wins every year using their own homemade water cannons. Just as every district has its own vibe in Berlin, Kreuzberg had a different feel from the rest. 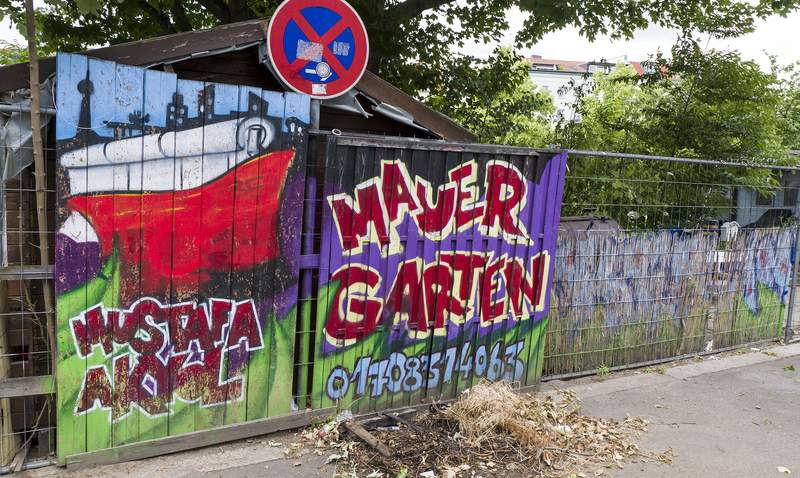 This former West Berlin neighbourhood has a large population of immigrants, particularly of Turkish descent. Many buildings have cheaper rent as they’re from the 19th century. This attracts a younger population, and a larger immigrant population. 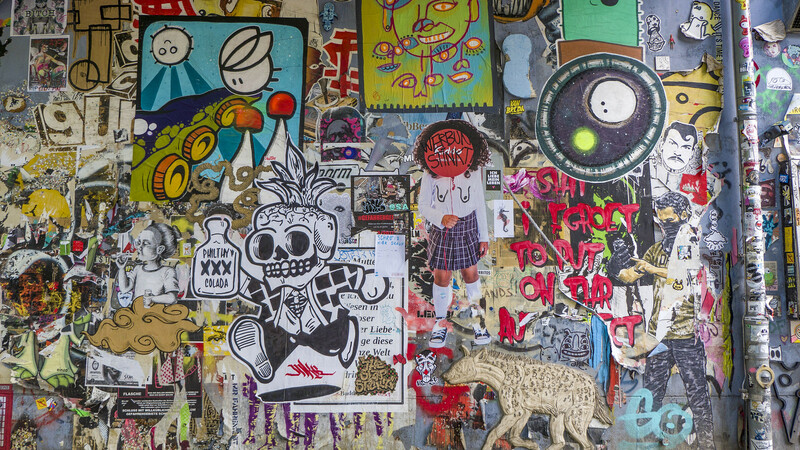 Known for its countercultural scene, it’s home to the punk rock movement in Berlin. 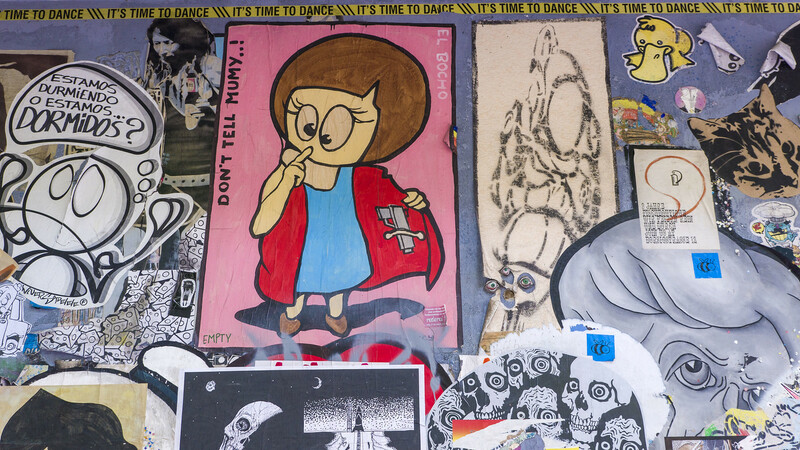 The youth of Kreuzberg are also influenced by rap and hip hop music. 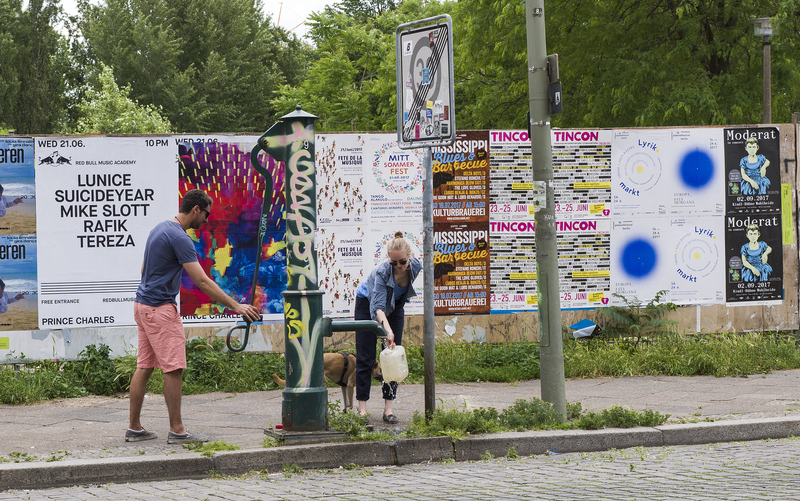 Kreuzberg is also the focal point of LGBTQ life, arts, and culture in the city. 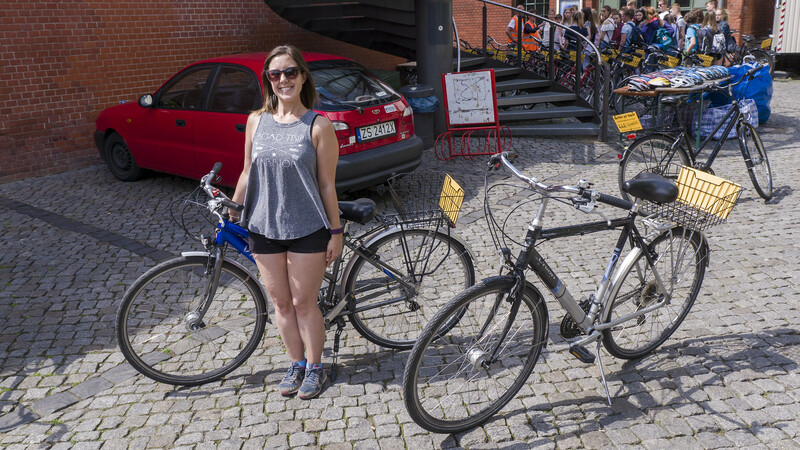 Our Berlin on Bike tour guide, Sascha, navigated us through parks and quaint city streets. Sascha told us a very interesting story about a small stretch of land that ended up on the wrong side of the wall. Although it belonged to East Germany, it physically sat in West German territory as the wall didn’t bend to accommodate the space. West Berlin resident, Osman Kalin, seized the land and built a garden there. He also built a small hut out of scrap materials that was constructed around an existing tree. The guards of both sides didn’t know what to do about this forgotten patch of land, and both sides didn’t do anything. When the wall came down in 1989, the home was almost demolished until locals came to the rescue to save it. While the garden didn’t look tended to when we visited, Sascha assured us that vegetables were harvested there last year. While we mostly cycled through the central borough of Mitte, there was one notable and hidden place we visited. In German, it’s called the Senatsverwaltung für Stadtentwicklung und Umwelt. So, why did we visit a senate building? There are several city models in this building, all to scale. It was interesting to track our path on this giant model of Berlin. 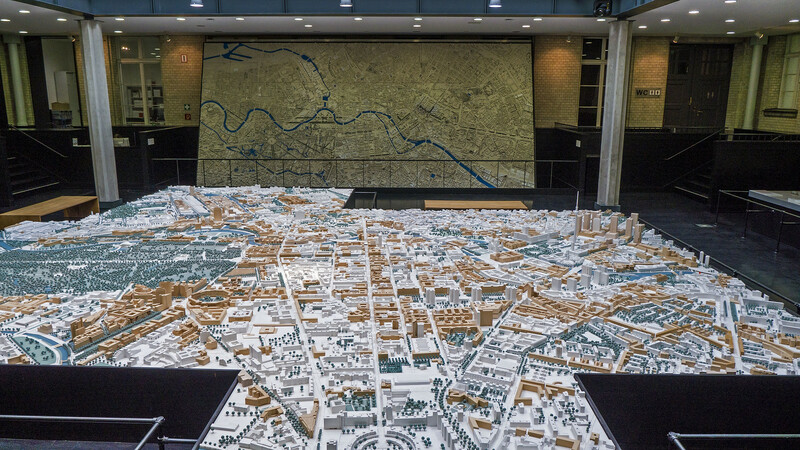 There’s also a model that reconstructs the city planning of the East German government. It’s not only fascinating to catch a birds-eye glimpse of Berlin, but I’m impressed by those who actually build these models. They’re so incredibly detailed and perfectly to scale. This is a unique and hidden gem of the city, and it’s completely free. Just walk right in from Monday to Saturday, 10:00am-6:00pm, at Am Köllnischen Park 3. 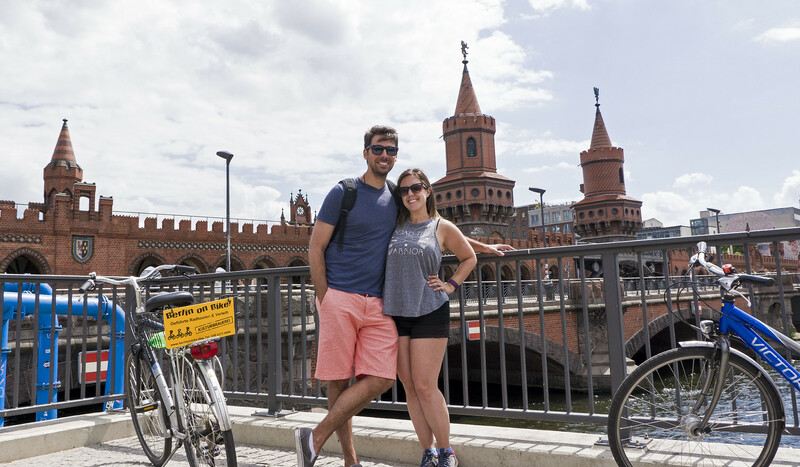 Justin and I thoroughly enjoyed our Berlin on Bike tour. The bike ride itself was not vigorous. We casually pedaled from place to place at our own pace. With every stop, we gained a new insight to this vibrant city. As it was our first time visiting Berlin, everything was completely new to us. 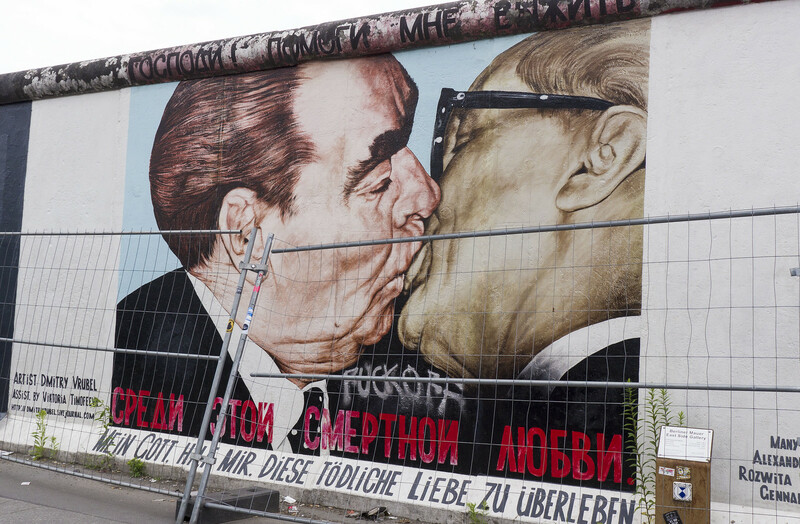 I felt like we learned so much information about Berlin that made us fall in love with the city even more. At the end of our tour, Sascha was gracious enough to trace our path on a map. It was amazing to see how much ground we covered in just a few hours. Seeing a place by bicycle is one of the best things you can do. While I adore walking and slowly absorbing my surroundings, you can see so much more when you’re cycling. I wouldn’t hesitate to take another tour with Berlin on Bike. While you can also rent bicycles to go out on your own, I highly recommend that you book one of their tours and learn from a local resident of this great metropolis. 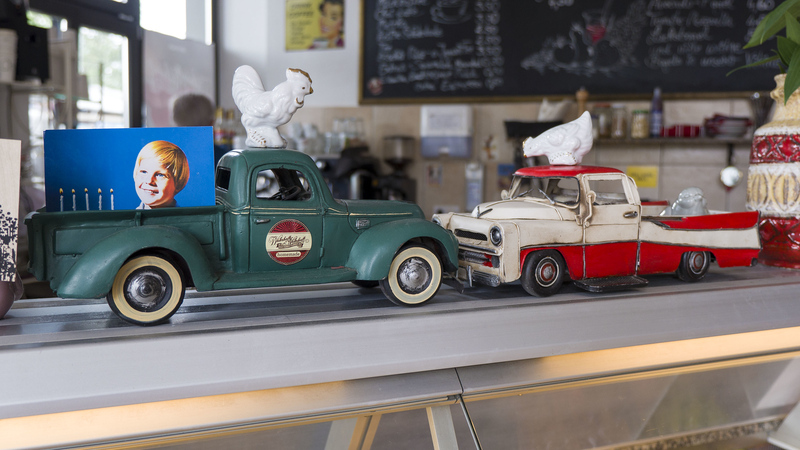 As Sascha informed us, Berlin is a city that’s constantly evolving. I’m sure when we return to Berlin someday, this tour could be an entirely new and different experience. To see all of our Berlin photos, including more pictures from this Berlin on Bike tour, please visit our Berlin travel photo album. Thank you so much to Visit Berlin, Germany Tourism, and Berlin on Bike for the incredible tour. Thank you so much for this beautiful article about your tour with us. Looks like some world class street art Lauren. Fabulous. No better way to see a city either. Being led by knowledgeable folks and traveling on bike helps you see all the stuff we miss when being whisked through an area by bus or car. Berlin looks like a place that I would really like to explore. So full of history and culture and looks like some great street art. Added to my list for sure! I’m with you all the way on this one. There’s nothing better than tourism on a bike. I bought a Wave ebike from https://waveelectricbikes.com for just this reason. It makes touring so much more enjoyable because it extends your range by many miles. When you’re too tired to keep pedaling, turn on the electric motor and let the bike do the work. This looks like a really cool tour! I’m a fan of cycling when visiting a new city, especially when the city is cyclist friendly! Thanks for the post – Definitely gonna check this tour out when I am in Berlin next time.